Ultimate Off the Beaten Path Willamette Valley Itinerary » Lavi was here. Having lived in California for almost two years now, a visit to the northern states has been long overdue. My increased interest in wine drew my curiosity to Oregon’s Willamette Valley. But I wasn’t only looking for good wine in Oregon, I was in search of adventure. I jumped at the opportunity to join Oregon Wine Country for a weekend road trip in the Willamette Valley. 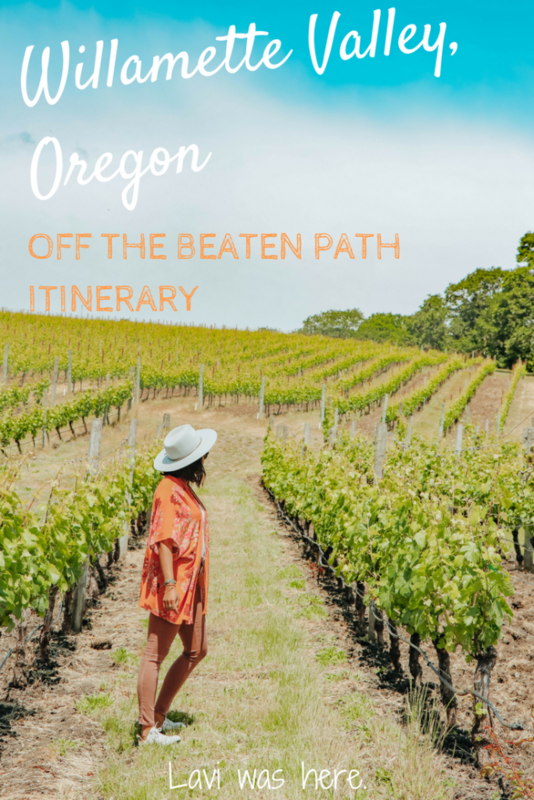 My main goal was to create an off the beaten path Willamette Valley itinerary to discover hidden gems. From unique accommodations to exhilarating activities, the Willamette Valley completely exceeded my expectations. Use this ultimate off the beaten path Willamette Valley itinerary to plan your trip to Oregon! Staying in uncommon accommodation is one of the best ways to get off the beaten path. Luckily, the Willamette Valley is full of interesting places to stay. Each place we stayed in our three-night visit was special in its own way. There are hotels all over the world. When in Oregon, challenge yourself to try one of these unique places to stay and you won’t be disappointed. 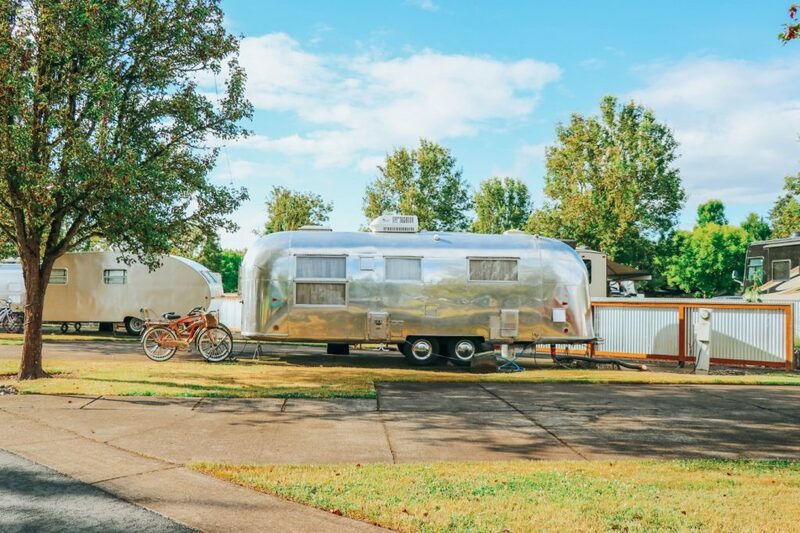 Airstreams are all the rage these days, and it’s no surprise why. What’s not to like about staying in a decked out trailer while in the outdoors? 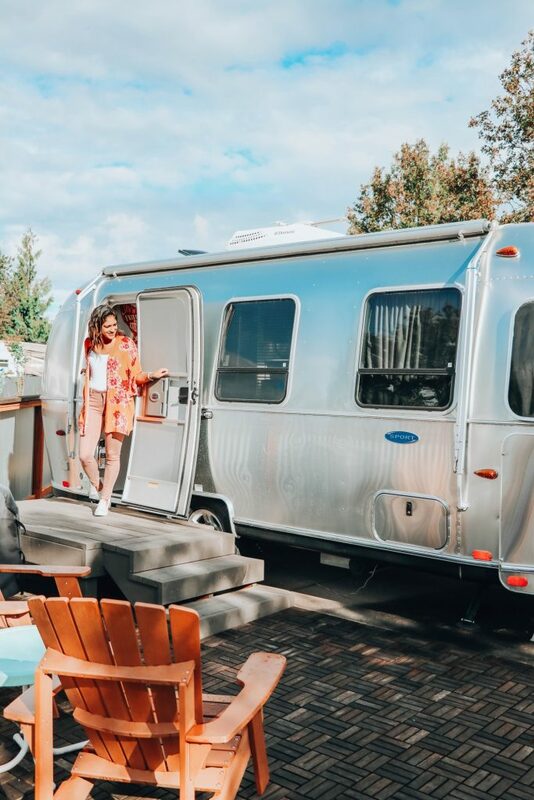 Consider spending the night glamping at The Vintages Trailer Resort near Dayton in the Willamette Valley. This was my first time staying in an Airstream and I LOVED it. The Vintages is a little RV neighborhood lined with 31 trailers of 19 styles. Each trailer offers pour-over coffee, plush robes, space heater, cooking utensils, and a comfortable bed. Guests can even grill outside on the patio or use the pool at the newly renovated clubhouse. Our little Airstream, named Buttercup, was the perfect size for the two of us. It even had a bathroom and Michael’s favorite game – Jenga! The Vintages was the perfect spot to spend the night in and relax together. After our first day on the go, staying at the Rushing River Retreat was the best way to wind down. 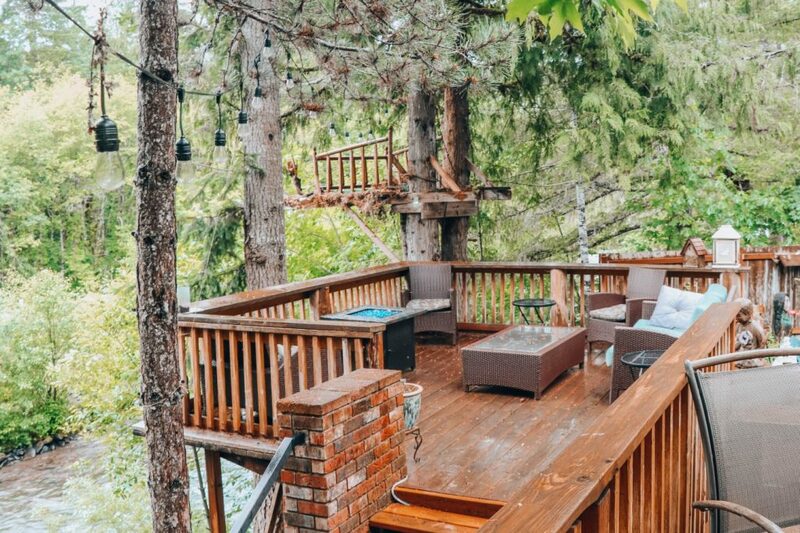 This beautiful B&B in Idanha, Oregon, is nestled in the peace and quiet of the Willamette National Forest. I didn’t expect the scenery to change so quickly from vineyards to the forest, but I was so happy to see an iconic Pacific Northwest view. With steady rain plaguing us, we didn’t have the opportunity to make use of the B&B’s beautiful outdoor spaces. But we couldn’t leave without walking out to the river and watch it powerfully rush past us toward Detroit Lake. Teresa, one of the Rushing River Retreat owners, was very hospitable and kind. We sipped IPAs and chatted late into the night as the fire crackled, warming us with its glow. It was an idyllic B&B experience, and there was no better feeling than waking up to the sounds of nature in the forest. This was one of the best night’s sleep I’ve had in a long time. Teresa even made us a delicious breakfast to fuel us for the next day. Our last night in Oregon was spent at the Leaping Lamb Farm. This is both an accommodation and unique experience in itself. Owners Scottie and Greg Jones moved to Oregon from Arizona and are putting farm stays on the map. 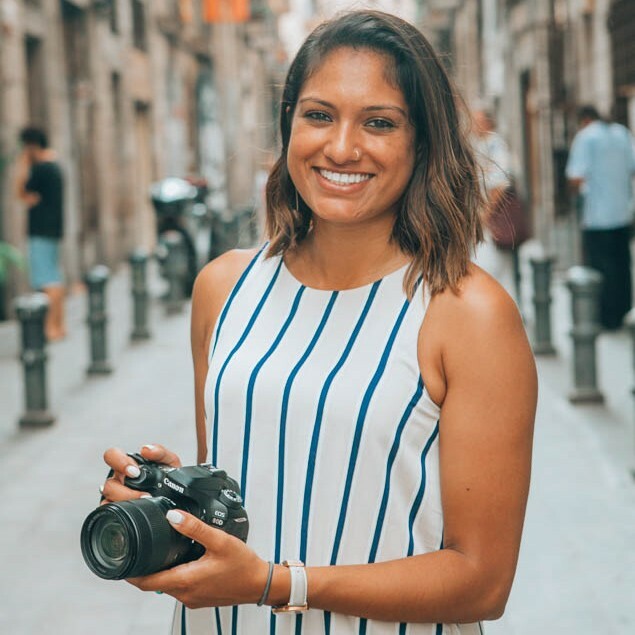 With Leaping Lamb Farm and Scottie’s second pursuit, Farm Stay US, they’re encouraging travelers to consider a farm experience when planning a getaway. 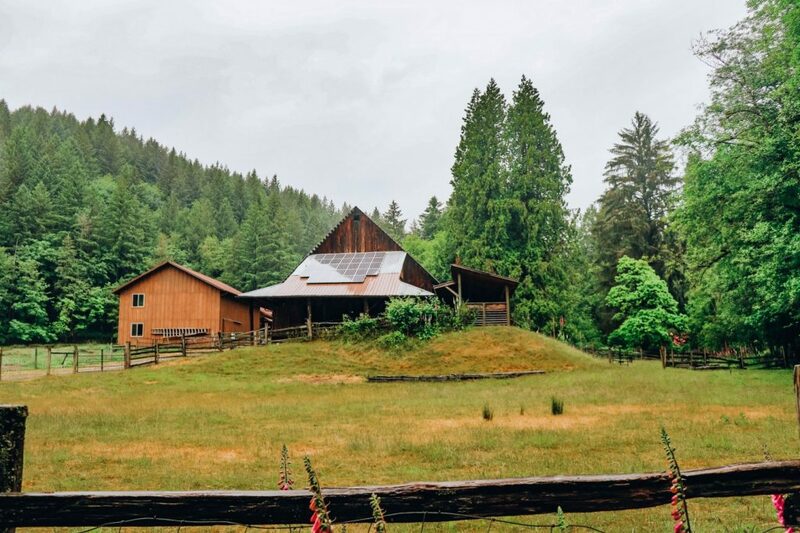 Located in Alsea, just southwest of Corvallis, the farm has a cottage and house to host couples, families, and groups. We spent the night in the comfy cottage, which had its own kitchen stocked with homemade bread. The house was beautifully decorated with Pendleton blankets hanging from the walls and draped over the beds and an electric fireplace warmed the entire house. The main farm house is equally decorated with beautiful interior designs and amenities. But what makes Leaping Lamb truly special is the farm experience. As a guest, you’ll gather eggs from the hen house for breakfast and feed the animals, including the chickens, ducks, turkeys, and a peacock (yes, peacock). I also had fed the horses, donkey, a baby lamb, and get cuddly with the baby goats. After staying at Leaping Lamb Farm, I couldn’t agree more with Scottie’s goal of increasing awareness of farm stays. The entire experience was new to me and completely wonderful. One of my main interests in the Willamette Valley was wine, of course. 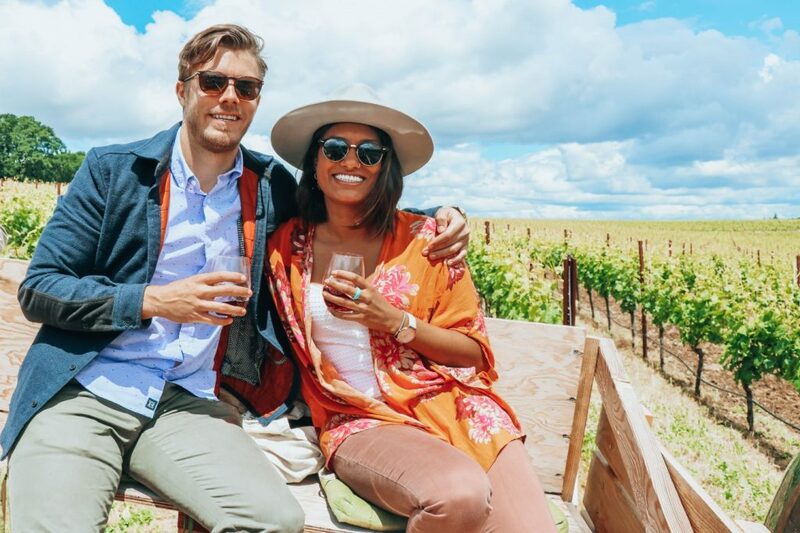 With over 500 wineries in the region, you’ll have to narrow down your choices when in the Willamette Valley for a weekend. I wanted to stick with an off the beaten path Willamette Valley itinerary, so we opted to visit three wineries that are lesser known and offered a more personal tasting experience. We began our wine-fueled adventure at Johan Vineyards, just west of Salem. I was happy to learn from Morgan, the associate winemaker, that the wine at Johan Vineyards is certified organic and biodynamic! The grapes are grown organically and processed sustainably to hold the wine to the highest standard. 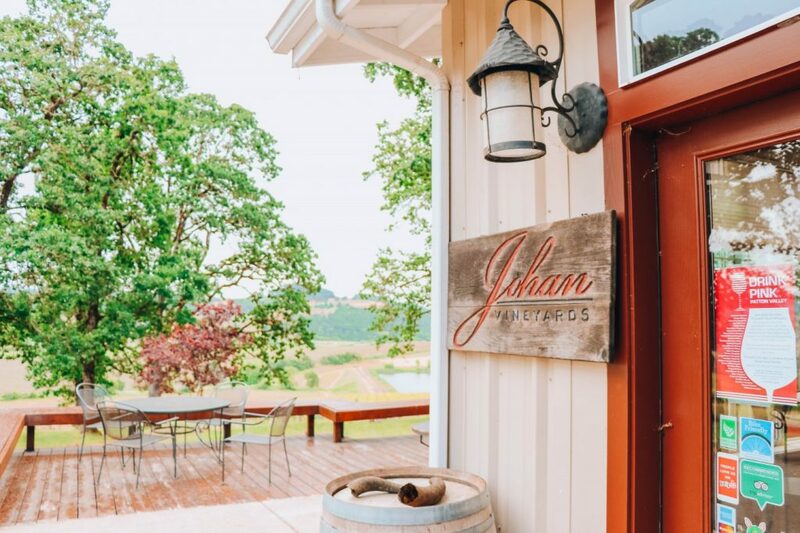 It was clear to us that the folks at Johan Vineyards take pride in their winemaking efforts and are truly passionate about organic viticultural practices. Our wine purchases: 2016 Pét-Nat Pinot Noir, the 2015 “Estate” Pinot Noir, and the 2014 “Drueskall” Pinot Gris. We continued wine tasting at Left Coast Cellars, which neighbors Johan Vineyards (they actually share the same gated entrance). 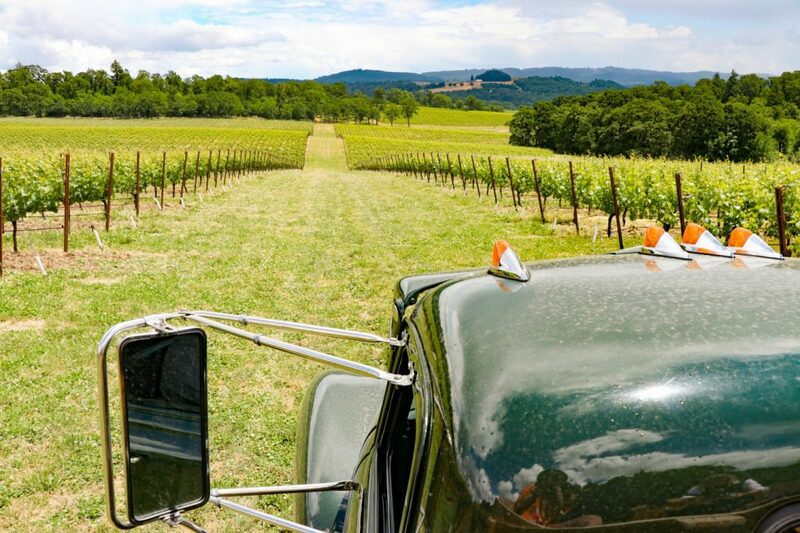 The highlight for me was the tour of the expansive vineyard while in the back of a 1950s vintage flat-bed truck with winery owners Bob and Suzanne. Bob drove our group while Suzanne chronicled the history of the winery and family. I was amazed by her story of learning about the Pinot grape when living in France and eventually pursuing her passion years later by starting Left Coast Cellars in Oregon. We tasted their wine while on the tour and afterward in their beautiful tasting room. Left Coast also makes pizza to go with their wine, and it is delicious. We visited at Spindrift Cellars to squeeze in a tasting before heading to the Willamette National Forest. This winery is a small operation with grapes from nearby vineyards. I loved that the tasting room is one of the few that’s located near downtown Corvallis, making it the perfect stop on our way out of town. Impressively, like Johan and Left Coast, Spindrift also practices sustainable wine grape growing practices. I know what you’re thinking. We drink a lot of wine. Yes, we do. 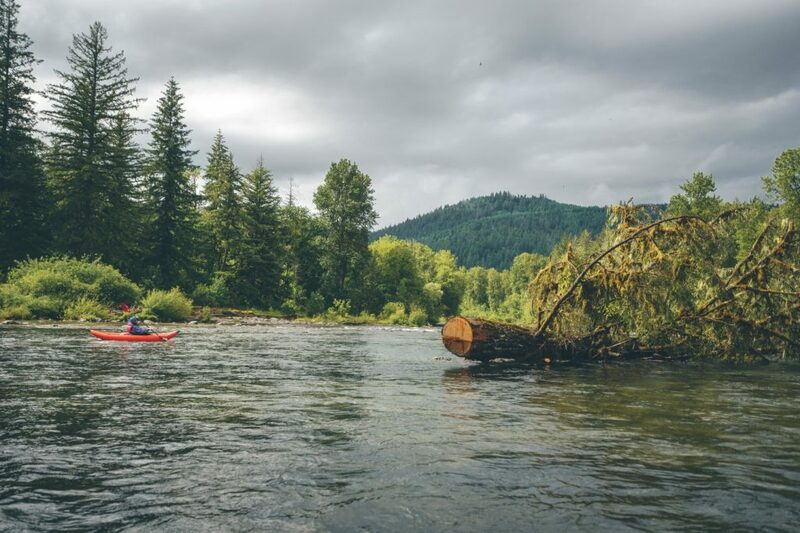 For an exhilarating outdoor experience, hit the Santiam River with eNRG Kayaking. I thought I knew how to kayak when Dave, our guide, taught us several strokes, but I’m so appreciative of his quick lesson. Adrenaline was pumping through my veins as I paddled over little rapids. Kayaking with eNRG really piqued my interest and I hope to go river kayaking again soon. 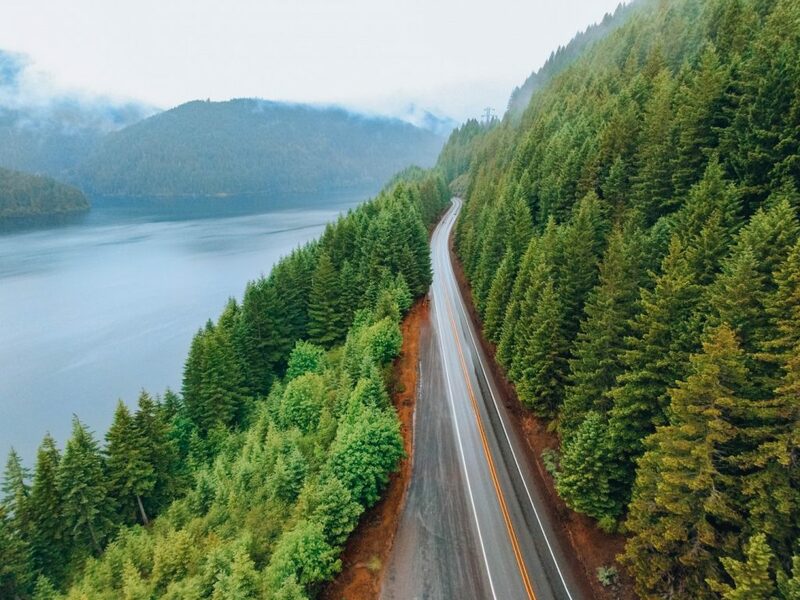 We just scratched the surface of the Willamette National Forest when we drove to Rushing River Retreat, but tall green trees and hills of the Pacific Northwest landscape were breathtaking. Detroit Lake, with its 9 miles in length, completely captivated me. The views alone are worth the visit. 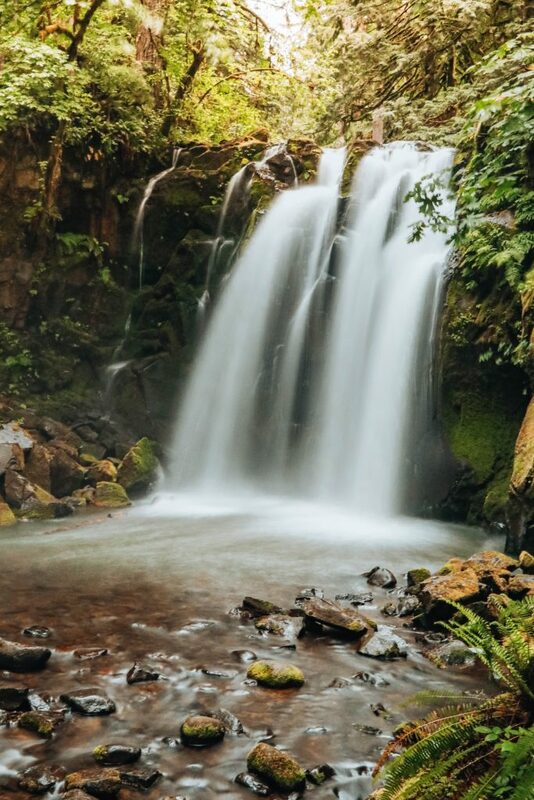 For a short hike or leisurely walk, McDowell Creek Park offers a serene and quiet space. The two main waterfalls, Majestic Falls, Royal Terrace Falls were my favorite, but there are also a few other waterfalls to see in the area. I even climbed up to the edge of Royal Terrace Falls where it’s possible to walk behind the waterfall, but it was a bit too slippery. 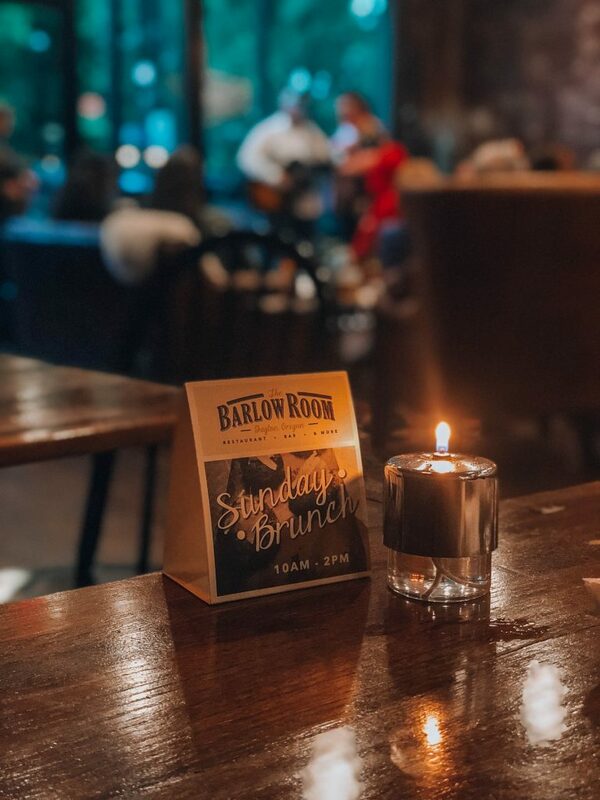 Dayton is a small town, but The Barlow Room was thriving with life when we had dinner on a Friday night. Diners can enjoy live music on occasion and craft beers with their meals. The food and ambience are worth the visit. Located in an old Baptist church, The Block House Café is a great spot to grab breakfast before exploring the Willamette Valley. The building is so unique and historic, and the food is delicious! I also couldn’t get over how nice the staff was (as was everyone in Dayton). Our waitress asked if I wanted my bacon to be crispy or chewy – I’ve never been asked this before and really appreciated it! I’m still dreaming about the pizza I ate at Left Coast Cellars. 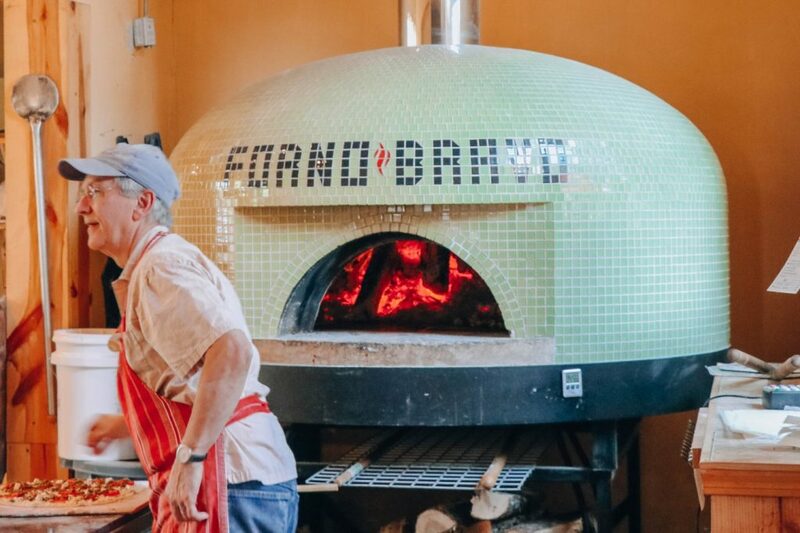 If good wine isn’t enough to draw you in, the pizza is yet another reason to add Left Coast to your off the beaten path Willamette Valley itinerary. For a fresh, local, farm-to-table meal, visit Frankie’s in Albany. Everything is good and it’s easy to see the staff feel a lot of love for the restaurant and its patrons. For great craft beer and laid-back atmosphere, make a stop at Block 15 Brewing in Corvallis. We visited the restaurant in town, but there’s also a separate tap room and brewery, too. We flew with Alaska Airlines because I’m a Mileage Plan member and we learned that we could pack our wines in a box to check in for free on our flight. Check out their Wine Flies Free service and participating states in which you can buy wine and check it in on your flight! (This post is not sponsored by Alaska Airlines, it’s just a convenient service). Your best bet when exploring the Willamette Valley is to rent a car. The drive from the Portland airport south through the valley is beautiful. Potential options are to drive to the Eugene airport and drop off the car or drive back north to Portland via the scenic Oregon coast or Willamette Valley. Thanks to Willamette Valley Visitors Association and Oregon Wine Country for hosting me. As always, all opinions and wine ramblings are my own! 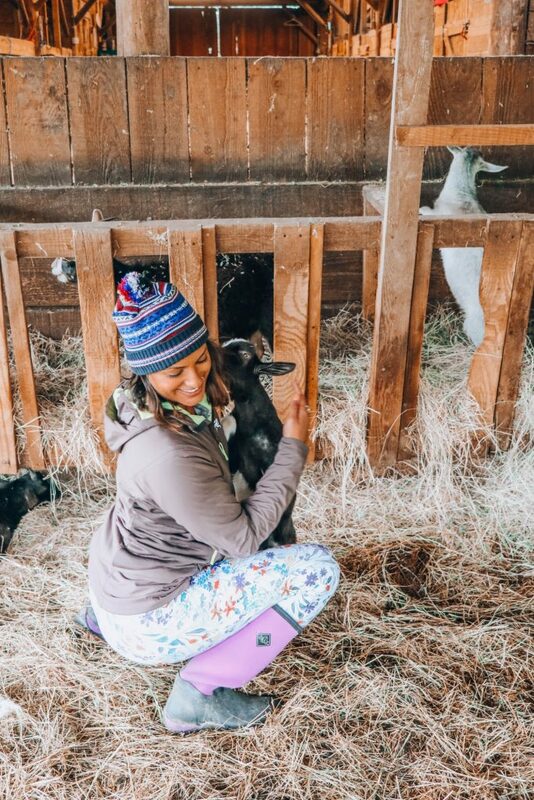 Lavi, so great to have you stay with us at Leaping Lamb Farm and especially to see your joy at being kissed by a goat kid! Glad the rain didn’t dampen the experience – it just made everything greener. And now you know what a farm stay is – only 99% of the population left to educate :)! Epic, I wish i did this when I was road tripping Oregon. Kayaking AND waterfalls?! Wow I need to visit these secret destinations in Oregon. Oh my gosh this region looks so beautiful! 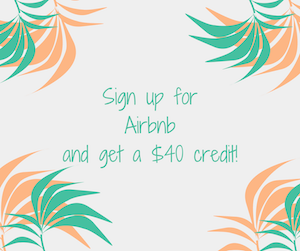 I love the idea of a farm stay and tree house and any excuse to kayak is a good excuse!